Powerful, moving and highly acclaimed, director Haile Gerima’s Sankofa is a masterpiece of cinema that has had a transformative impact on audiences since its release in 1993. This empowering film tells a story of slavery and of the African Diaspora from the perspective of the enslaved, challenging the romanticizing of slavery prevalent in American culture. Sankofa was developed from 20 years of research into the trans-Atlantic slave trade and the experiences of African slaves in the New World. The film represents complex characters and empowering moments of resilience that assert humanity in the face of subjugation. Unlike Hollywood’s depiction of slavery, Gerima presents the often suppressed history of slave resistance and rebellion and represents the enslaved as agents of their own liberation. The story begins with Mona (Oyafunmike Ogunlano), an African American model on a fashion shoot at the former slave castles in Cape Coast, Ghana. Mona undergoes a journey back in time and place to a slave plantation in North America where she becomes Shola, a house slave, and experiences the suffering of slavery firsthand. In becoming Shola and returning to her past culture and heritage, Mona is able to recover her lost slave identity and confront her ancestral experience. Shola’s interactions with her fellow slaves are marked with humanity and dignity, most notably with Shango (Mutabaruka), a rebellious field slave, and Nunu (Alexandra Duah), one of the few slaves to remember her life in Africa before being stolen by Europeans. The film’s narrative structure follows the concept of “Sankofa,” an Akan word that signifies the recuperation of one’s past in order to comprehend the present and find one’s future. Intercultural Women’s Centre S.U.S.I (susi-frauen-zentrum.com/ und facebook.com/susi.frauenzentrum/). Jamile da Silva e Silva (Project Coordinator S.U.S.I) will give a short introduction to Sankofa Kita before the screening. After the award-winning Ashes & Embers (1982) and the documentaries Wilmington 10—U.S.A 10,000 (1978) and After Winter: Sterling Brown (1985), Gerima filmed his epic, Sankofa (1993). 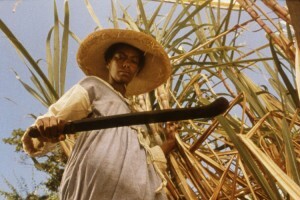 This formally ambitious tale of a plantation slave revolt was ignored by U.S. distributors, but Gerima tapped into African American communities, and booked sold-out screenings in independent theaters around the country. In 1996, Gerima founded the Sankofa Video and Bookstore in Washington, DC., a cultural and intellectual space that offers opportunities for self-expression, interaction, discussion and analysis through community events such as film screenings, book signings, scholar forums and artist showcases. Gerima continues to distribute and promote his own films, including his most recent festival success, Teza (2008), which won the Jury and Best Screenplay awards at the Venice Film Festival. He also lectures and conducts workshops in alternative screenwriting and directing. Sankofa is an Afrocentric and bilingual early childhood program for children between the ages of 1 and 6 in Berlin, Germany. It was founded by a group of parents and parents play an active role in the overall management of the Kita. Sankofa is a safe space for Black children in which they may develop without inhibitions and cultivate a healthy sense of self. At Sankofa, our children will practice empathetic and respectful interaction towards one another and our surroundings. Sankofa’s pedagogical concept focuses primarily on free and imaginative play. Through this, children are given the opportunity to develop creatively, fine-tune their social skills and confidently own their natural initiative. Movement, arts, music and interaction with nature are other central aspects of our concept.